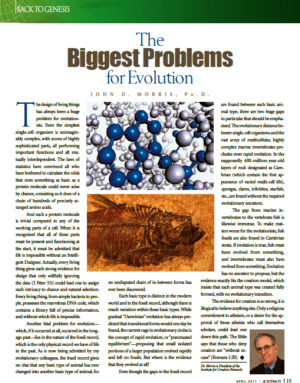 Institute for Creation Research President Dr. John Morris has taken to recycling; in this case he’s dusted off some nonsense from an article he wrote 3 years ago titled “Evolution’s Biggest Hurdles” (Morris 2008) and repackaged it as “The Biggest Problems for Evolution” (Morris 2011). As I usually do I started out writing a point by point re-rebuttal to Morris’s new article; even though I already wrote a fairly extensive rebuttal to the earlier version. However, as I was writing, and as it got longer and longer, I realized that I was going to bury the lead way too deep. So, I am dropping most of the rehashing and jump to the new issues I want to address. Morris: Even though the gaps in the fossil record are found between each basic animal type, there are two huge gaps in particular that should be emphasized. The evolutionary distance between single-cell organisms and the vast array of multicellular, highly complex marine invertebrates precludes even rapid evolution. Oh boy, this is déjà vu all over again. From earlier context (see below) the “rapid evolution” he is referring to here is supposed to be punctuated equilibrium, however P.E. about apparent, geologically, “rapid” transitions (say a few tens of thousands of years) and concerns species level transitions (like those necessary to evolve horses and zebras from a common ancestor) not multicellular organisms from unicellular ones. Again, I’ll have more on his use of P.E. below. As for the gap between unicellular and multicellular organisms the (really) short answer is: choanoflagellates (colony forming single celled organisms that are strikingly similar to cells found in sponges called choanocytes). Again, see my earlier post “You can tune a piano but you can’t tunicate” for more. Morris: In the supposedly 600-million-year-old layers of rock designated as Cambrian (which contain the first appearance of varied multi-cell life), sponges, clams, trilobites, starfish, etc., are found without the required evolutionary ancestors. Wrong, wrong, wrong. I covered this before as well. 1) There are fossils of multicellular organism in Precambrian strata (the Ediacaran biota for example). 2) Amongst those Precambrian multicellular organisms are sponges and jellyfish. 3) “Clams” (bivalve mollusks) are known from the Cambrian but only from few tiny extinct types. 4) Starfish or sea stars (Class Asteroidea) fossils do not appear in the fossil record until the Ordovician. Morris: The gap from marine invertebrates to the vertebrate fish is likewise immense. Again, Dr. Morris doesn’t want you to know about invertebrate chordates or the evidence for a relationship between chordates and echinoderms. I’ll have more on this in a few moments. Morris: To make matters worse for the evolutionists, fish fossils are also found in Cambrian strata. If we define the colloquial term “fish” in the usual way (in reference to all aquatic, gill bearing, vertebrates) then yes, a few genera of “fish fossils” have indeed been found in Cambrian strata. 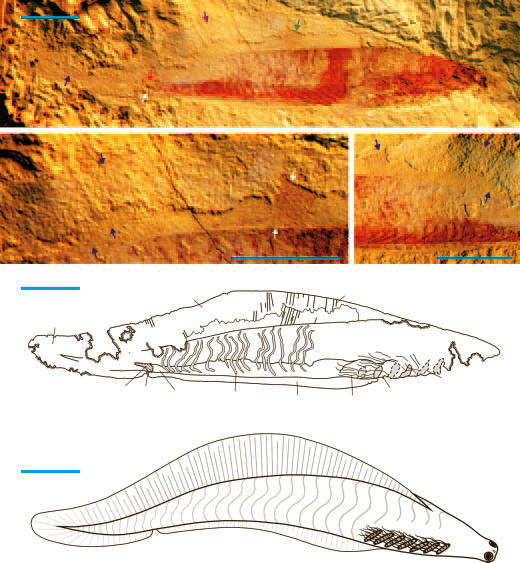 I think it is fair to say that most people who are not particularly familiar with vertebrate phylogeny and paleontology—including most of Dr. Morris’s readers—might assume when they read in his article that “fish fossils are also found in Cambrian strata” that the large centrally displayed picture of a fossil fish might in fact be one of the Cambrian fish Morris is referring to. Unfortunately they would be badly mistaken. 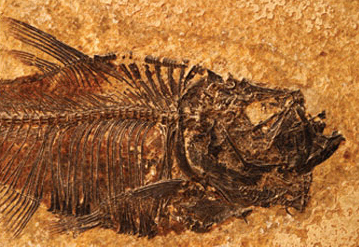 What Dr. Morris has done is present his readers with a picture of an Eocene “fish” from 56 to 34 million years ago—apparently purchased from a stock photography site—rather than an actual Cambrian “fish” from 542 to 488 m.y.a.. And this is despite the fact that the stock photography site clearly labels the picture as being “…a fossil Eocene fish on a textured sandstone background”. What is more, temporal displacement is not the only problem with this picture. The “fish” pictured in Morris’s article is, I am fairly sure, a teleost fish of some sort. Teleosts (a clade of the bony, ray finned fishes) are a hugely diverse group that includes most of the fish people are familiar with (goldfish, seahorses, trout, halibut, catfish, piranha, clownfish, guppies, barracuda, bass, angelfish etc. etc. etc.). Never mind Dr. Morris’s imaginary “problems for evolution”, how under the Flood geology that Dr. Morris advocates, did teleost fish, which dominate aquatic environments today, manage to avoid leaving any fossils until the Late Triassic period? How under Morris’s views did they manage to avoid burial until roughly half way through the Flood deposits? 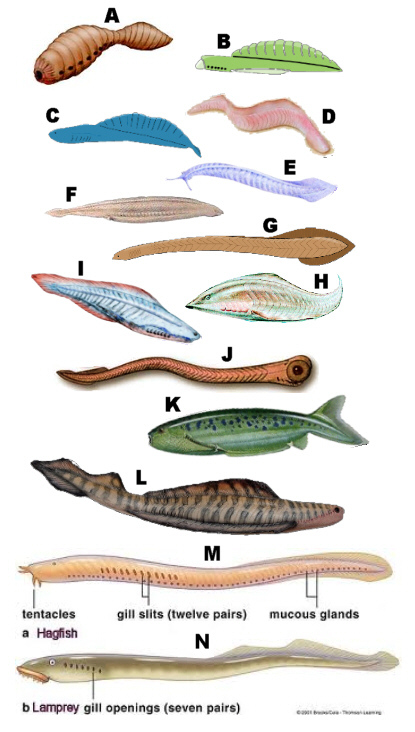 As for the “fish” that have been found in Cambrian strata, these are small basal Agnathan, or jawless, fish lacking even paired fins, whose closest living relatives include the lampreys and hagfish. So not only was Dr. Morris’s picture off by over 400 million years but it taxonomically missed by an entire Superclass (Agnatha vs. Osteichthyes). Taxonomically speaking, this is a bit like confusing a bunny rabbit with a Gila monster. Morris: If evolution is true, fish must have evolved from something, and invertebrates must also have evolved from something. Evolution has no ancestor to propose, but the evidence exactly fits the creation model, which insists that each animal type was created fully formed, with no evolutionary transition. No ancestors save for those invertebrate chordates I mentioned earlier. Below is a phylogram that shows both the geological and phylogenetic relationship of Haikouichthys from the same paper that supplied the reconstruction above (Zhang & Hou, 2004). 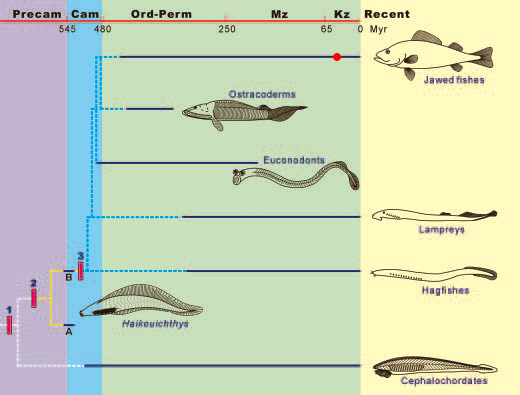 Note that Haikouichthys is from the Cambrian and falls closer to the common ancestor of cephalochordates (one of invertebrate chordates groups) and other Agnathans such as the hagfishes. Also I have placed a small red circle near the top right-hand part of the illustration to indicate approximately where the fossil fish pictured by Dr. Morris would be placed geologically and phylogenetically. A more detailed phylogram can be found here. Those who have taken a course in zoology, or perused a zoology textbook, may recognize the cephalochordate (the critter at the very bottom) pictured in the diagram above as the extant genus Branchiostoma (aka Amphioxus or the lancelet). However there is an ever growing pantheon of Cambrian fossils that appear to be either basal invertebrate chordates similar to cephalochordates or possibly more distantly related hemichordates, all fairly similar in their general anatomy to Haikouichthys. Here are some reconstructions of some of these organisms along with some extant chordate relatives. Organisms are not to scale or necessarily in chronological and phylogenetic order: (A) Didazoon, a vetulicolian (a group possibly related to chordates) – Early Cambrian (B) Yunnanozoon, a hemichordate or chordate – Early Cambrian (C) Haikouella, a possible chordate – Early Cambrian (D) Cathaymyrus, a cephalochordate – Early Cambrian (E) Pikaia, a cephalochordate – Middle Cambrian (F) Branchiostoma, an extant cephalochordate (G) Metaspriggina, a chordate – Middle Cambrian (H) Myllokunmingia, a chordate, possible basal vertebrate – Early Cambrian (I) Haikouichthys, a basal vertebrate – Early Cambrian (J) a Conodont, a chordate ranging from the Cambrian to the Late Triassic (K) Pharyngolepis, a agnathan vertebrate –Silurian (L) Jamoytius, a agnathan vertebrate –Silurian (M) a hagfish, extant agnathan chordate (N) a lamprey, extant agnathan vertebrate. Disclaimer: I am not creator of any of these illustrations (I only compiled them). They are all pulled off the net for non-profit educational purposes, so hopefully this will be considered fair use. The fact that basal vertebrates like Haikouichthys appear in the fossil record before more derived vertebrates and are morphologically similar to contemporaneous invertebrate chordates is exactly what one would expect under evolutionary theory. On the other hand there is no logical expectation that such a pattern should occur under the Flood geology favored by Dr. Morris. Morris: As is now being admitted by my evolutionary colleagues, the fossil record gives no clue that any basic type of animal has ever changed into another basic type of animal, for no undisputed chain of in-between forms has ever been discovered. Maybe that is because evolutionary theory does not postulate that organisms of one “basic type” (undefined weasel-words) change into another “basic type” of organism. Rather under evolutionary theory, organisms of “basic type”, or otherwise, share common ancestors. For example mammals, like ourselves, share a common ancestor with insects like fruit flies. But that common ancestor was neither a mammal nor an insect. Instead it was likely a tiny soft bodied worm-like species living (based on molecular evidence) in the sea some 980 million years ago. As for the existence of intermediate forms, it depends on what you mean by “basic types”. Are there known fossil intermediates between the ancestors of mammals and insects? No. Are there known intermediate fossils between, say, mammals and synapsid “reptiles”? Sure. And there are plenty of other examples between higher taxonomic categories (fish-amphibian, dinosaur-bird etc.). Are these examples “undisputed”? No, of course they’re not, and the use of this qualifier is more weaseling on Dr. Morris’s part. Any ignoramus, or Institute of them, can “dispute” even the most well established facts of science. The question is, is there any reasonable, rational, evidence based, dispute about the existence of intermediate fossil forms, and the answer to that is no. Morris: Each basic type is distinct in the modern world and in the fossil record, although there is much variation within these basic types. With all the weasel-words one wonders if Dr. Morris is attempting some sort of Pauly Shore imitation. Again what constitutes a “distinct” “basic type” in this context? The first thing that popped into my head when I read this was “what about platypuses?” I mean they’re mammals that lay eggs! Or what about lungfish (it’s right there in the name), micropterigids (basal moths that retain mandibles), guitarfish (intermediate between sharks and rays), or squat lobsters (lobster-like crabs)? And those are just a few extant types of the top of my, amateur naturalist, head. I’m sure a few zoologists from different specialties could go on and on with similar examples of living organism that exhibit intermediate characteristics. 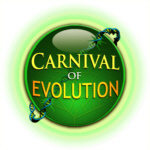 Morris: While gradual “Darwinian” evolution has always predicted that transitional forms would one day be found, the current rage in evolutionary circles is the concept of rapid evolution, or “punctuated equilibrium”—proposing that small isolated portions of a larger population evolved rapidly and left no fossils. But where is the evidence that they evolved at all? Well, that’s not exactly a correct description of punctuated equilibrium, but it was written by a creationist so you can’t expect too much. Still it is better that most of them manage when trying to describe P.E., so perhaps we can get this creationist to talk to Dr. Morris and see if he can talk some sense into… oh, hold on, that was Dr. Morris, Dr. Morris from 2010 (Morris 2010, p. 12). Apparently he forgot to tell Dr. Morris of 2011. Morris: The evidence for creation is so strong, it is illogical to believe anything else. Only a religious commitment to atheism, or a desire for the approval of those atheists who call themselves scholars, could lead one down this path. Says the guy who apparently doesn’t know an echinoderm from a urochordate or an agnathan from a teleost. The eternal question remains: is he being deliberately misleading (lying) or is he simply (very) ignorant? Either way why would anyone take his pronouncements regarding the evidence for or against anything to do with evolution seriously? This entry was posted in Antievolution, Comparative anatomy, Creationism, Defending evolution, Evolution, Paleontology, Systematics, Zoology and tagged agnathans, amphioxus, Branchiostoma, Cambrian fish, cephalochordates, chordates, Creationism, Eocene fish, Flood geology, hagfish, Haikouella, Haikouichthys, Insitute for Creation Reseach, John Morris, lampreys, lancelet, Myllokunmingia, Pikaia, punctuated equilibrium, teleosts, vertebrates, young earth creationism, Yunnanozoon. Bookmark the permalink. Great article Troy. Yes, fish is definately a teleost, and a highly derived one at that (to judge from the mouth). I’m not a fish person so can’t name the family, but maybe someone else can. Thanks! Yeah, was about 99% sure it was. Even if it wasn’t a teleost it was clearly a ray finned fish and not an agnathan. The argument that Morris is making is equivalent to saying that because I can’t find John Hancock’s feather pen, the American Revolution didn’t happen. When all of the evidence is on one side and it all builds up to a solid conclusion, the opponents can only cast doubt. And all the evidence is stacked up against evolution and has built a solid conclusion. Evolution is a religious fairy tale philosophy not based on science. I was just referred to this site by a friend and I am delighted. You do a fine job of deflating “Dr.” Morris. I commend your efforts and hope a whole lot of folks who sit on the fence about this issue will listen to your comments and take heed. 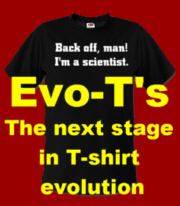 Alas…the creationists seem to be completely unable to change, no matter the evidence before them. Thanks! As for “Dr.” Morris, to be fair unlike some other creationists he does hold a legitimate Ph.D., in Geological Engineering (from the University of Oklahoma). I guess if you needed help building an earthwork dam or something, he might be your man; anything to do with actual geology or paleontology, not so much. The Earth and universe are NOT billions of years old, let alone millions. and your geologic layers DO NOT exist. What is even more damaging to your ignorance and belief in this nonsense is the fact that in many locations around the world (where not only are the layers NOT found in the same order the textbooks place them in) objects (like trees and whales) are found upright through MANY of these layers. Are you going to attempt and tell us that they remained this way until “millions” of years of dirt accumulated around them? Get a clue! Do yourself a favour and conduct a simple science experiment. Take handfuls of varying dirt, toss them into a bottle of water, shake it up and let it be. You’ll notice that everything settles into layers. Didn’t take a million years to reach that conclusion. Furthermore, you have NO accurate way of dating anything. None of your dating methods work. They’ve all proven flawed. The fact you use circular reasoning to date your stuff shows the flaw in your logic. You claim you know how old the layers are by the dinosaur bones found in them, and then you claim to know how old the dinosaur bones are by the layers they are found in. In other words, you make it up. Do yourself another favour: take your idiotic evolutionary theory and apply the laws of our universe and simple mathematics to all the REAL science. Your “millions” and “billions” of years suddenly fall apart.